The Porcelain Enamel Institute showcases and promotes innovations in materials and processing to improve the overall efficiency of enamelling operations, encourages product use in all possible applications, and advances and protects the legitimate interests of the industry and its individual members. 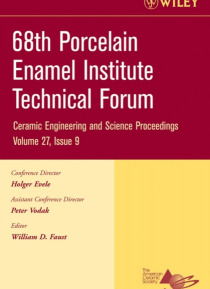 Papers that comprise this book are taken from the 68th Annual Porcelain Enamel institute Technica… l Forum, May 15-18, 2006. Organized and sponsored by The American Ceramic Society and The American Ceramic Society's Engineering Ceramics Division in conjunction with the Nuclear and Environmental Technology Division.